The balance between Th1 and Th2 development is determined by IL-4 and IL-12. While the role for CD4+ NK1.1+ T (NKT) cells in influencing this balance has been recognized based on their capacity to produce IL-4, it is unknown how IL-12 is produced in the innate immune system in which they participate. This study demonstrates that Ag-activated CD4+ NKT cells express CD40 ligand (CD40L) (CD154), which engages CD40 on APC and stimulates them to produce IL-12. Culture of B cell-depleted spleen cells from C57BL/6 mice with α-galactosylceramide (α-GalCer) capable of selectively stimulating Vα14/Jα281+ NKT cells resulted in the production of IL-12 together with IFN-γ and IL-4. 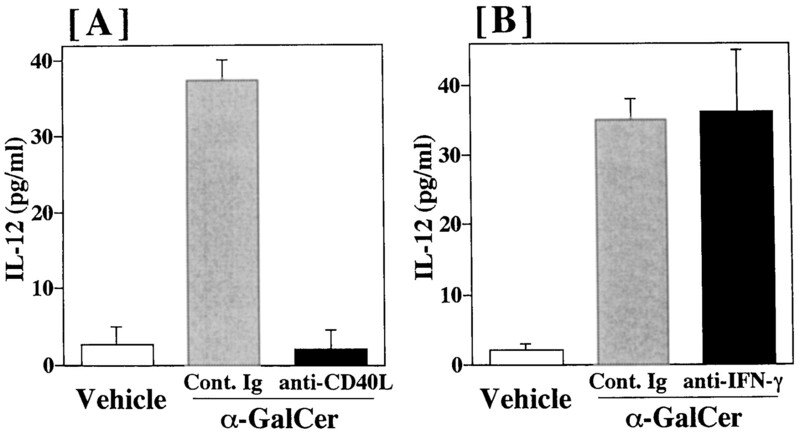 α-GalCer-induced IL-12 production occurred in I-Abβ-deficient mice, but not in β2-microglobulin-deficient and Vα14/Jα281 TCR-deficient mice, and was inhibited by anti-CD40L mAb. Of CD4+ and CD4− NKT cells, the capacity to express CD40L/CD154 and trigger IL-12 production following α-GalCer stimulation was exhibited preferentially by the CD4+ NKT subset. 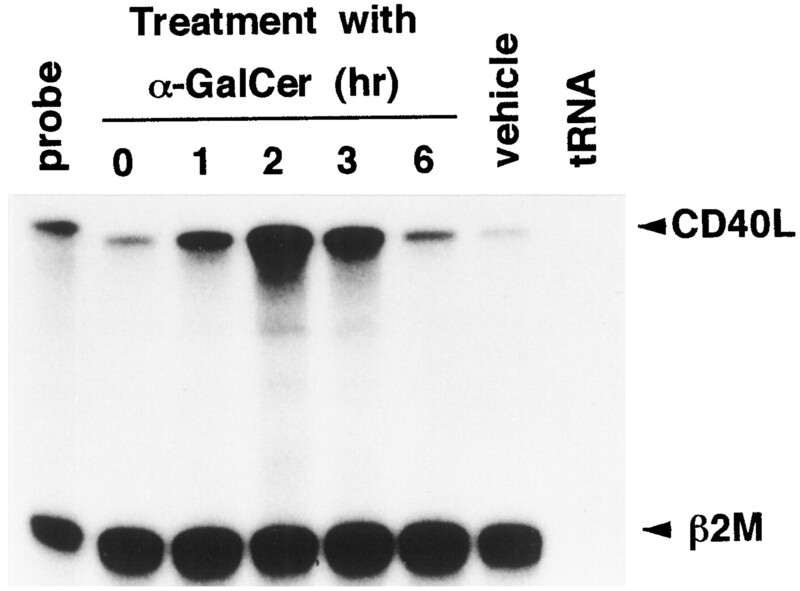 IL-12 production was also observed in α-GalCer-treated mice. Production of IL-12 preceded IFN-γ production, and IL-12 was required for IFN-γ, but not IL-4, production. A stimulatory/inhibitory relationship existed between IL-12 and IL-4 production. These results illustrate a novel function of CD4+ NKT cells that could be involved in the regulation of Th1 vs Th2 development. A particular Th cell subset (Th1 vs Th2) becomes dominant during the development of many diseases, especially infectious diseases, and determines the severity of the disease state. Although a number of factors shape the commitment of naive CD4+ T cells to Th1 or Th2, the most important of these factors appears to be the cytokines present at the initial phase of the disease (1). In particular, IL-4 strongly promotes the differentiation into Th2 cells (2, 3), while IL-12 and IFN-γ strikingly enhance the differentiation into Th1 cells (4, 5, 6). Because the balance between Th1 and Th2 development is determined by IL-4 and IL-12/IFN-γ, a key to understanding the physiologic importance of the two differentiation processes would be to identify the sources of the regulatory cytokines and to determine what regulates the production of these cytokines. One intriguing hypothesis has been that effector cells involved in the innate immunity play a pivotal role in shaping initial T cell activation (7, 8, 9, 10). In this regard, a population of T cells expressing NK1.1+ T (NKT)3 cells, in particular a CD4+ NKT population that expresses an almost invariant TCRαβ specific for the MHC class I-like molecule CD1 (11, 12, 13), was shown to be capable of producing substantial amounts of IL-4 upon stimulation with anti-CD3 (14, 15). This subset secretes a large amount of IFN-γ when stimulated through NK1.1 molecules (16). Thus, it appears that NKT cells are bipotential cells that may initiate both Th2- and Th1-type immune responses. However, in virtually all studies, IL-4/IFN-γ production was observed in response to polyclonal stimulation, such as anti-CD3 or anti-NK1.1, rather than the activation with Ag plus CD1. No information exists regarding how the critical cytokine for Th1 development, IL-12, is produced and incorporated into the NKT-mediated immunobalance. Thus, the cellular sources and inductive mechanisms of cytokines that drive Th1/Th2 development need to be elucidated. A recent study identified α-galactosylceramide (α-GalCer) as the ligand that binds the unique TCR encoded by the Vα14 and Jα281 gene segments and demonstrated CD1-restricted and TCR-mediated activation of Vα14 NKT cells by α-GalCer (17). This study investigated the induction of cytokines during α-GalCer-stimulated culture of NKT cells and APC. The results show that stimulation of B cell-depleted splenocytes with α-GalCer resulted in the production of IL-12 by APC and the production of IL-4/IFN-γ by NKT cells, whereas IL-12 production preceded IL-4/IFN-γ production. IL-12 was found to be produced by APC interacting with CD4+ NKT cells, but not with CD4− NKT cells. The CD4+ NKT cells expressed CD40 ligand (CD40L) by stimulation with α-GalCer plus CD1. IFN-γ production by NKT cells was secondary to IL-12 production. Thus, these results demonstrate that CD4+ NKT cells, which have the capacity to express CD40L following TCR stimulation, induce APC to produce IL-12. The capacity of CD4+ NKT cells to stimulate IL-12 production, together with their own IL-4-producing ability, underlies the microenvironment in which CD4+ T cells are allowed to differentiate into either Th1 or Th2. C57BL/6 (B6) mice were purchased from Shizuoka Laboratory Animal Center (Hamamatsu, Japan). MHC class I-deficient (β2-microglobulin (β2 M)−/−) and MHC class II (I-Abβ)-deficient (Aβ−/−) mice were obtained from Taconic (Germantown, NY). The Vα14 NKT-deficient mice (Jα281−/−) were established by specific deletion of the Jα281 gene segment by homologous recombination and aggregation chimera techniques (18). The Jα281−/− mice were backcrossed three times with B6 mice. CD40-deficient mice (CD40−/−) (19) were kindly provided by Dr. H. Kikutani (Institute for Molecular and Cellular Biology, Osaka University, Osaka, Japan) and backcrossed six times with B6 mice. KRN7000, a representative of synthetic α-GalCer was prepared in Pharmaceutical Research Laboratory, Kirin Brewery (Takasaki, Japan). In this paper, KRN7000 was described as α-GalCer. Mouse rIL-12 was provided by Genetics Institute (Cambridge, MA). The following mAbs were used. Anti-CD3 (145-2C11) (20) and anti-CD16/CD32 FcγR III/II (2.4G2) (21) were each purified from the culture supernatant (SN). Anti-CD4 (American Type Culture Collection (ATCC), Manassas, VA; clone GK1.5), anti-CD40L (HM40L-1) (22), and anti-IL-12 (C17.8) (23) mAbs were purified from the ascitic fluids of mice bearing hybridomas producing the relevant Ab. FITC-conjugated anti-TCRαβ (H57-157), FITC-conjugated anti-CD4 (RM4-4), PE-conjugated CD40L (MR1), biotinylated anti-NK1.1 (PK136), and APC-conjugated anti-CD4 (RM4-5) mAbs were obtained from PharMingen (San Diego, CA); RED670-conjugated streptavidin (Life Technologies, Gaithersburg, MD), control hamster IgG (Cappel, Durham, NC), and control rat IgG (Biomeda, Foster City, CA) were also purchased. α-GalCer (2 μg/mouse) in PBS containing 0.025% polysolvate 20 or vehicle (PBS + polysolvate 20) was injected i.p. into B6 mice. Spleen cells were depleted of B cells by immunomagnetic negative selection as described (24, 25). Briefly, spleen cells were incubated with magnetic particles bound to goat anti-mouse Ig (Advanced Magnetic, Cambridge, MA). Surface Ig-negative cells (B cell-depleted fraction) were obtained by removing cells bound to the magnetic particles with a rare earth magnet (Advanced Magnetic). In some experiments, B cell-depleted spleen cells were further depleted of CD4+ cells by treatment with anti-CD4 (GK1.5) followed by incubation with goat anti-rat Ig-coated magnetic beads (Advanced Magnetic). The purity of the resulting CD4+ cell-depleted population was checked by flow cytometry with FITC-conjugated anti-CD4 (RM4-4), which does not compete with GK1.5 mAb for binding to CD4. Contamination of CD4+ cells in this population was <1%. B cell-depleted and B + CD4+ cell-depleted spleen cells were stimulated with immobilized anti-CD3 mAb (10 μg/ml) or α-GalCer (100 ng/ml in 0.1% DMSO) in 0.5 ml (48-well culture plates, Costar 3548; Costar, Cambridge, MA) or 1 ml (24-well culture plates, Corning 25820; Corning Glass Works, Corning, NY) of RPMI 1640 medium supplemented with 10% FBS and 2-ME in a humidified atmosphere at 5% CO2 at 37°C. Cells and culture SN were harvested and assessed for the expression of CD40L or assayed for cytokine concentration. The assay system was essentially the same as described by Gately and Chizzonite (26). Briefly, each well of 96-well microculture plates was coated with 10 μg of purified anti-IL-12 mAb (C15.1) (23). Culture SN or serum together with standard mouse rIL-12 solution was incubated in wells of the mAb-coated plates. After washing, cells (1.5 × 104/well) of the IL-12-dependent cell line 2D6 (27) were cultured on the anti-IL-12-coated plates for 48 h and pulse-labeled with 20 KBq/well of [3H]TdR for the final 6 h. All samples were cultured in triplicate. The absolute concentration of IL-12 was determined by extrapolation from a standard curve generated using known amounts of rIL-12 (27). Results were expressed as the mean ± SE of triplicate cultures for culture supernatant or of six animals for serum. The detection limit of this assay was 1 pg/ml. The concentrations of IFN-γ and IL-4 were measured by ELISA. Mouse rIFN-γ and rIL-4 were purchased from R&D Systems (Minneapolis, MN). The IFN-γ ELISA system was prepared using two types of anti-mouse IFN-γ mAb (XMG1.2; Endogen, Cambridge, MA) and biotinylated R4-6A2 (R4-6A2 was purified from R4-6A2 hybridoma and biotinylated in our laboratory). The IL-4 ELISA was constructed using anti-mouse IL-4 mAb (11B11 and biotinylated BVD4-1D11; BVD4-1D11 mAb was purified from the corresponding hybridoma and biotinylated in our laboratory). R4-6A2, 11B11, and BVD4-1D11 hybridomas were obtained from ATCC. IL-12, IL-4, and IFN-γ produced in cultures were neutralized by addition of 10 μg/ml anti-IL-12 (C17.8), anti-IL-4 (11B11), and anti-IFN-γ (R4-6A2) mAbs, whose efficacy had been confirmed beforehand. To detect the expression of CD40L on CD4+ and CD4− NKT cells, four-color flow cytometric analysis was performed. Cells were first incubated with anti-FcγR III/II mAb (2.4G2) to prevent the staining mAbs from binding with the Fc receptors. These treated cells were then stained directly with PE-conjugated anti-CD40L and biotinylated-anti-NK1.1, followed by FITC-conjugated anti-TCRαβ, RED670-conjugated streptavidin and APC-conjugated anti-CD4. The stained cells were analyzed by FACScalibur (Becton Dickinson, Mountain View, CA). CD40L expression was detected by gating on a CD4+ or CD4− TCRαβ+ NK1.1+ population. The cDNA probes for mouse IL-12 (p40 and p35) and β2M were kindly provided by Dr. Stanley Wolf (Genetics Institute) and Dr. Takeshi Tokuhisa (Chiba University Medical School, Chiba, Japan), respectively. CD40L cDNA was cloned from mouse whole spleen cells using the following procedure. Total RNA was isolated from whole spleen cells that had been treated for 6 h with 10 μg/ml anti-CD3. The RNA was then used as a template for first-strand cDNA synthesis. The complete mouse CD40L coding sequence was cloned from the cDNA by use of Taq DNA polymerase, standard PCR conditions and the following primers: a 5′ sense oligonucleotide, ATGATAGAAACATACAGCC, and a 3′ antisense oligonucleotide, TCAGAGTTTGAGTAAGCC, based on nucleotides 13-31 and 778-795, respectively, of the sequence that encodes CD40L (28). The PCR product was purified by agarose gel electrophoresis and ligated to a T-vector (29). Briefly, Bluescript (Stratagene, La Jolla, CA) plasmid was digested with EcoRV, and the digests were incubated with Taq polymerase in standard buffer conditions in the presence of 2 mM dTTP for 2 h at 70°C. After phenol extraction and precipitation, the T-vector was ready for cloning. The PCR product was then ligated to the vector. Total cellular RNA was isolated by the acid guanidium-thiocyanate-phenol-chloroform method, and mRNA levels were determined using the RNase protection assay, according to the procedure as described (30). Riboprobes were prepared from the full-length IL-12 p40 and p35 cDNA, each of which was subcloned into Bluescript plasmid (Stratagene). The plasmids were linearized with Pvull (p40), BsaHI (p35), or BamHI (CD40L), and in vitro transcription was initiated in the presence of [α-32P]UTP. A total of 10 μg of total cellular RNA was hybridized in solution to a 32P-labeled antisense riboprobe for 16 h at 55°C in 80% formamide. The protected fragment (257 bp for p40, 315 bp for p35, and 433 bp for CD40L) was separated on a denaturing sequencing gel, followed by autoradiography. As an internal control of the amount of RNA loaded onto the gel, RNA was simultaneously hybridized to the antisense 32P-labeled probe for the B2M gene, which yielded a 127-bp protected fragment. An earlier study (17) demonstrated that stimulation of Vα14 NKT cells with α-GalCer or anti-CD3 mAb results in the production of IL-4 and IFN-γ. We examined whether this is observed using B cell-depleted splenocytes that contain Vα14 NKT cells as a minor population (Fig. 1⇓). The B cell-depleted splenic fractions were prepared from normal B6 spleen cells by negative selection and stimulated with either α-GalCer or immobilized anti-CD3. Fig. 1⇓ shows that both IL-4 and IFN-γ are produced in cultures stimulated with either reagent. Considering that IL-12 production is induced through interactions between activated T cells and APC (25, 31), we next examined whether α-GalCer stimulation induces IL-12 production. IL-12 was produced in B cell-depleted splenocyte cultures following stimulation with α-GalCer as well as anti-CD3. The results also show that IL-12 production was induced earlier than IL-4/IFN-γ production. Production of IL-12, IL-4, and IFN-γ by B cell-depleted splenocytes following stimulation with α-GalCer or anti-CD3. B cell-depleted splenocytes (6 × 106 cells/well) from normal B6 mice were cultured in 24-well culture plates coated with 10 μg/ml anti-CD3 (upper panels) or containing 100 ng/ml α-GalCer (lower panels) for various times. Culture SNs were assayed for the concentration of IL-12, IL-4, and IFN-γ, as described in Materials and Methods. The data are representative of three similar experiments. Our previous study (25) showed that IL-12 is produced by APC through interaction with anti-CD3-activated conventional CD4+ T cells. The cell type(s) involved in α-GalCer-mediated IL-12 production by B cell-depleted splenocytes was investigated using splenocytes obtained from β2M−/− mice, which lack Vα14 NKT cells and CD8+ T cells, Vα14 NKT-deficient mice (Jα281−/−), and Aβ−/− mice, which lack conventional CD4+ T cells (Fig. 2⇓). In splenocytes obtained from the two types of knockout strains lacking Vα14 NKT cells (β2M−/− and Jα281−/−), IL-12 production was induced when B cell-depleted splenocytes were stimulated with anti-CD3. Portions of the same splenocytes produced only small amounts of IL-12 following α-GalCer stimulation. In contrast, splenocytes from Aβ−/− mice, which lack conventional CD4+ T cells but contain Vα14 NKT cells, produced large amounts of IL-12, even at a lower cell concentration when stimulated with α-GalCer. These results indicate that Vα14 NKT cells are required for inducing IL-12 production following α-GalCer stimulation. Requirement for Vα14 NKT cells in α-GalCer-stimulated IL-12 production. B cell-depleted splenocytes from β2M−/− (3 × 106 cells/well), Jα281−/− (1.5 × 106 cells/well), and Aβ−/− mice (1.5 × 106 cells/well) were stimulated with immobilized (10 μg/ml) anti-CD3 for 12 h or 100 ng/ml α-GalCer for 24 h. The data are representative of two similar experiments. We examined whether IL-12 production induced following stimulation of Vα14 NKT cells with α-GalCer depends on the interaction between CD40L and CD40. Fig. 3⇓A shows that addition of anti-CD40L mAb to a culture of B cell-depleted B6 splenocytes and α-GalCer results in almost complete inhibition of IL-12 production. This suggests that CD40L is induced on the surface of a given splenocyte population(s) following TCR stimulation, as has been observed on TCR-triggered conventional CD4+ T cells (25). Because IFN-γ has been shown to up-regulate IL-12 production by APC (32, 33), we also examined whether IL-12 production is affected by neutralizing IFN-γ that might be produced by TCR-stimulated NKT cells. As shown in Fig. 3⇓B, addition of anti-IFN-γ mAb did not reduce the level of IL-12 production. Inhibition of Vα14 NKT cell-dependent IL-12 production by anti-CD40L mAb. B cell-depleted B6 splenocytes were stimulated with α-GalCer (100 ng/ml) in the presence of 10 μg/ml anti-CD40L mAb or control hamster Ig (A) or of anti-IFN-γ mAb or control rat Ig (B) for 24 h. The data are representative of three similar experiments. The following experiments were performed to examine the expression of CD40L on TCR-stimulated NKT cells. Because the CD4+ and CD4− NKT subsets both include Vα14 NKT cells (13), the level of CD40L expression in each subset was analyzed (Fig. 4⇓). B cell-depleted splenocytes from B6 mice were stimulated with anti-CD3 or α-GalCer for various lengths of time (1, 3, 4.5, 6, and 9 h) and then stained with anti-TCRαβ, anti-NK1.1, anti-CD4, and anti-CD40L as described in Materials and Methods. The ratio of CD4+ and CD4− NKT cells in a B cell-depleted population following anti-CD3 stimulation is shown in Fig. 4⇓A. 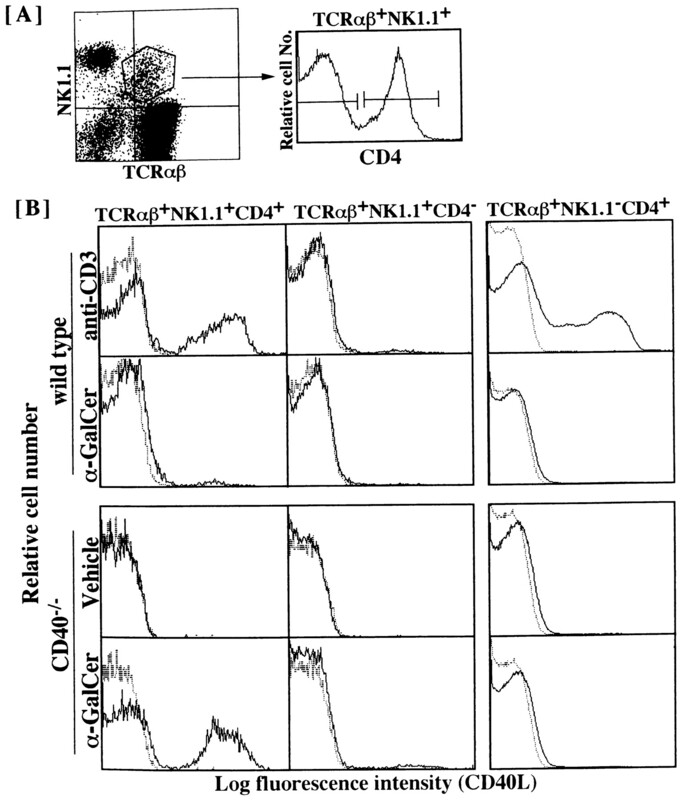 The TCRαβ+ NKT cell population consists of CD4+ and CD4− cells (∼30% and 65%, respectively). This was also the case with α-GalCer-stimulated splenocytes (data not shown). As shown in Fig. 4⇓B, CD40L expression was observed on a considerable proportion of anti-CD3-stimulated CD4+ NKT cells, but not on CD4− NKT cells. When TCR stimulation was provided by α-GalCer, CD40L was also induced on a small but detectable portion of CD4+ NKT cells. Fig. 4⇓B (upper two panels) shows the histograms obtained 3 and 4.5 h after stimulation with anti-CD3 and α-GalCer, respectively, at which the peak levels of CD40L expression were seen. The proportion of TCRαβ+ NKT cells in splenocytes from wild-type mice was ∼2.5%. Among these, a part of these cells express CD40L (Fig. 4⇓B). In Jα281−/− mice, the proportion of TCRαβ+ NKT cells was <1.0%. Of these NKT cells, the frequency of CD4+ NKT cells was negligible, and CD40L was not detected even after anti-CD3 stimulation. Induction of CD40L on CD4+ NKT cells following stimulation with anti-CD3 or α-GalCer. B cell-depleted splenocytes from wild-type B6 mice and those from CD40−/− mice were stimulated with immobilized anti-CD3 for 3 h or with α-GalCer for 4.5 h. Cells were stained with anti-TCRαβ, anti-NK1.1, anti-CD4, and anti-CD40L mAbs as described in Materials and Methods. A, The CD4-positivity of NKT cells (TCRαβ+ and NK1.1+ cells) is shown. B, Analysis gates for CD40L were set on TCRαβ+NK1.1+CD4+, TCRαβ+NK1.1+CD4−, or TCRαβ+NK1.1−CD4+ populations. The data are representative of three similar experiments. Nevertheless, the proportion of CD40L+ NKT cells in cultures of α-GalCer-stimulated splenocytes from B6 mice is low. In a separate study, we recently found that CD40L expression on activated T cells is inhibited in the presence of CD40-positive cells, and that a higher proportion of T cells obtained from CD40−/− mice express CD40L after TCR stimulation compared with wild-type T cells (S. Ono, manuscript in preparation). Based on this information, we examined CD40L expression on NKT cells obtained from CD40−/− mice following α-GalCer stimulation. Fig. 4⇑B (lower panel) illustrates that a high proportion of CD4+ NKT cells express CD40L following α-GalCer stimulation, whereas most CD4− NKT cells do not express CD40L. CD40L was not detected on splenocytes, including CD4+ NK T cells from wild-type (data not shown) and CD40−/− mice (Fig. 4⇑B) without α-GalCer stimulation (vehicle stimulation). 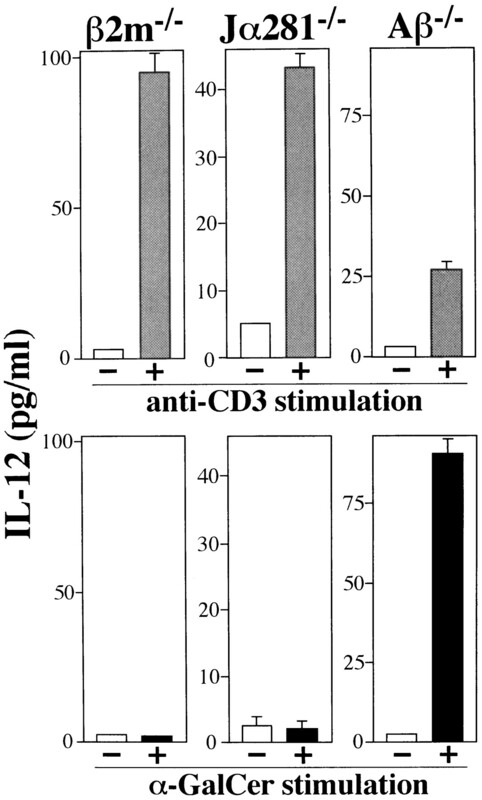 Conventional CD4+ T cells expressed CD40L after anti-CD3 stimulation, but CD40L was not induced on these cells by α-GalCer stimulation (Fig. 4⇑B). Together, the results indicate that CD40L is expressed exclusively by the CD4+ NKT subset. We next determined whether IL-12 production in cultures of B cell-depleted splenocytes following α-GalCer stimulation is induced exclusively by CD4+ NKT cells with the capacity to express CD40L. B cell-depleted and B + CD4+ cell-depleted splenic fractions were stimulated with α-GalCer (Fig. 5⇓A). IL-12 production was induced in B cell-depleted splenocytes containing CD4+ NKT cells, but not in the CD4+ cell-depleted fraction. Requirement for CD4+ NKT cells in IL-12, IL-4, and IFN-γ production in B cell-depleted splenocytes after α-GalCer stimulation. B cell-depleted and B + CD4+ cell-depleted splenocyte populations were stimulated with α-GalCer in the absence of blocking mAb (A) or in the presence of anti-IL-12 mAb (10 μg/ml) or control Ig (B). The results are representative of three similar experiments. We also examined which subset of NKT cells is responsible for IFN-γ and IL-4 production (Fig. 5⇑B). A large portion of the IFN-γ and IL-4 produced following α-GalCer stimulation was mediated by the splenocyte population containing the CD4+ NKT cell subset. The results also show that, as IFN-γ production was largely inhibited by IL-12 neutralization, IFN-γ production by CD4+ NKT cells was not induced merely as a result of TCR triggering, but instead was ascribed to the stimulation of IL-12 produced in the same culture. In contrast, IL-4 production occurred independently of IL-12. Thus, stimulation of CD4+ NKT cells with the appropriate Ag leads to the production of three cytokines, IL-12, IL-4, and IFN-γ, in a direct manner or as a secondary effect. Additional experiments were performed to investigate whether any stimulatory or inhibitory relationship exists between IL-12 and IL-4 production. As shown in Fig. 6⇓A, IL-12 production by APC was considerably down-regulated when IL-4 was neutralized with anti-IL-4 mAb. Neutralization of IL-12 resulted in different effects on IFN-γ and IL-4 production. Namely, a large proportion of IFN-γ production was inhibited by IL-12 neutralization (Fig. 6⇓B), whereas this treatment enhanced IL-4 production at later time points (Fig. 6⇓C). Thus, the results indicate a stimulatory/inhibitory relationship between IL-12 and IL-4 production induced in cultures stimulated with α-GalCer. Stimulatory/inhibitory effects of IL-12 and IL-4 on the production of other cytokines. B cell-depleted splenocytes were stimulated with α-GalCer in the presence of anti-IL-4 mAb (10 μg/ml), anti-IL-12 mAb (10 μg/ml), or control Ig in 24-well culture plates for the indicated lengths of time. We examined whether IL-12 is induced in vivo in α-GalCer-treated B6 mice. Mice were injected i.p. with 2 μg α-GalCer and sacrificed at various time points following administration. Total RNA was isolated from spleens and assayed for the mRNA expression of IL-12 p35 and p40 (Fig. 7⇓A). 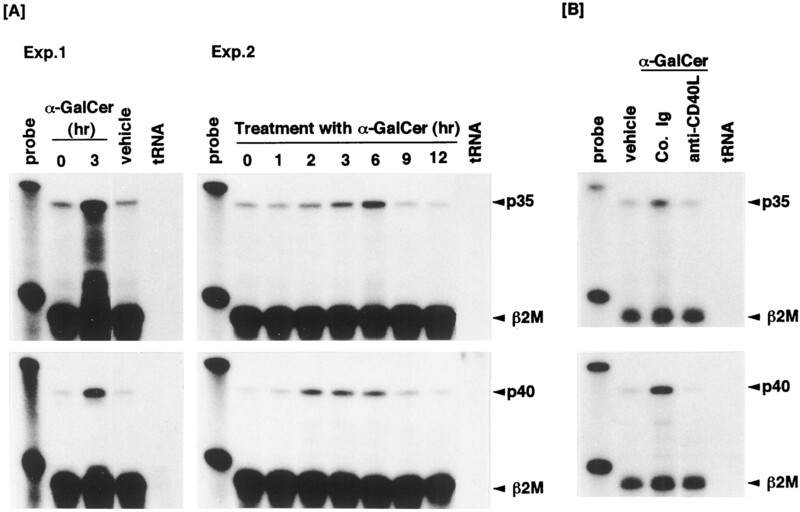 The mRNAs of both p35 and p40 mRNAs were detected 2, 3, and 6 h after α-GalCer administration. Induction of IL-12 mRNA expression was not limited to the spleen, but was observed in various other organs, including the liver (data not shown). Fig. 8⇓ shows that the same protocol of α-GalCer treatment induced the expression of CD40L in the spleen cells, before IL-12 mRNA expression. Consistent with the results of Fig. 3⇑, IL-12 induction was almost completely inhibited by injection of anti-CD40L mAb (Fig. 7⇓B). Fig. 9⇓ demonstrates that a single injection of α-GalCer induces a striking increase in serum IL-12 (p70) levels. Such an increase was detectable as early as 3 h after α-GalCer administration, and, after reaching the peak levels around 6–9 h, the levels decreased within 18 h after the administration. IL-4 was also produced at early time points, but IFN-γ production was observed at a relatively later time point, which is consistent with the notion that IFN-γ production is largely dependent on IL-12 production. Together, these observations indicate that α-GalCer is capable of stimulating IL-12 induction in various organs that have been known to contain NKT cells. mRNA level of IL-12 p35 and p40 mRNAs in the spleen from α-GalCer-treated mice. B6 mice were injected i.p. with 2 μg α-GalCer. Various times later, total RNA was isolated from two spleens/time and subjected to RNase protection assay (A). B6 mice were given 2 μg α-GalCer 1 day after the injection of 1 mg anti-CD40L mAb or control Ig. Total RNA was isolated 6 h later (B). Level of CD40L mRNA in the spleen from α-GalCer-treated mice. B6 mice were given 2 μg α-GalCer. Various times later, total RNA was isolated from the spleens. Production of IL-12 p70, IFN-γ, and IL-4 following α-GalCer administration. B6 mice were injected i.p. with 2 μg α-GalCer. Various times later, mice were sacrificed and serum was individually harvested. The concentration of IL-12 p70 was measured by an Ab capture assay. The concentrations of IFN-γ and IL-4 were measured by ELISA. Data are expressed as the mean ± SE of six serum samples/group. The results obtained in this study show that stimulation of Vα14 NKT cells, in particular CD4+ Vα14 NKT cells, with the relevant Ag (α-GalCer) plus APC leads to IL-12 production by the APC and IFN-γ/IL-4 production by the CD4+ Vα14 NKT cells. The capacity of CD4+ Vα14 NKT cells to stimulate IL-12 production is explained by the finding that α-GalCer stimulation induces the expression of CD40L, capable of stimulating IL-12 production in CD40+ APC, exclusively on CD4+ Vα14 NKT cells, but not on CD4− NKT cells. This is a distinct property of the CD4+ NKT cell subset. Further, IFN-γ production by CD4+ Vα14 NKT cells was largely secondary to IL-12 production, while IL-4 was produced by the same subset of NKT cells independently of IL-12 production. However, the interaction of CD4+ NKT cells and APC induced a stimulatory/inhibitory relationship between IL-12 and IL-4 production. Finally, IL-12 expression was induced in vivo in animals treated with a reagent triggering Vα14 NKT cells. Thus, the present study provides important information regarding the role for CD4+ Vα14 NKT cells in inducing/stimulating the production of cytokines with the capacity to modulate Th1/Th2 differentiation. NKT cells are a specialized lymphoid population that coexpress a restricted repertoire of TCRαβ and receptors of the NK lineage (reviewed in 13). This population of cells has been shown to mediate the rejection of allograft bone marrow (34), control the development of autoimmune diseases (35, 36), and initiate antitumor responses (18, 37). Increasing attention that has been paid to the NKT subset may be based on the findings that NKT cells, particularly CD4+ NKT cells, have the capacity to produce IL-4 (14, 15) or IFN-γ (16), depending on which surface molecules on NKT cells are stimulated. However, previous studies on IL-4/IFN-γ production were made by stimulating NKT cells with anti-CD3 or anti-NK1.1 mAb (14, 15, 16), and it remained unclear which types of Ag are recognized in the context of CD1 (CD1d) by the TCR of NKT cells. Although recent studies have reported the binding of CD1d with synthetic peptides of 14-24 amino acids with a defined hydrophobic motif (38) and the natural association of CD1d with self ligands (39), it is unlikely that these ligand-CD1d complexes stimulate NKT cells to produce IL-4 or IFN-γ. In this context, a recent study identified αGalCer as a ligand capable of strongly stimulating the TCR of Vα14 NKT cells restricted to CD1d (17). Thus, this finding led us to investigate the nature and mechanism underlying the activation of Vα14 NKT cells with a ligand plus CD1. Th1/Th2 differentiation is influenced by IL-4 and IL-12 (2, 3, 4, 5), and it appears that IFN-γ regulates the sensitivity of T cells to IL-12 (6). In contrast to evidence for the capacity of NKT cells to produce IL-4, it has not been clear whether NKT cells participate in the production of IL-12 and, if so, how IL-12 is produced following NKT activation. The most important aspect of the present study is elucidation of the pathway of IL-12 production associated with the activation of NKT cells. The amounts of IL-12 produced in the present culture system were mostly <100 pg/ml. These small amounts of IL-12 could be measured only in the bioassay using an IL-12-responsive T cell clone that we established (27). Considering that IL-12 is generally capable of producing various effects in rather smaller amounts than other cytokines, such low levels of IL-12 production should be biologically significant. IL-12 is produced predominantly by macrophages (Mφ) and dendritic cells (DC) (32, 33, 40). Recent studies have also revealed that IL-12 production by Mφ/DC is induced through two different pathways of stimulation: 1) when the cells are exposed to various pathogens or their products (33, 41), and 2) when Mφ/DC as APC interact with activated T cells (25, 31, 42, 43). Since IL-12 production induced through the interaction of activated T cells and APC is inhibited by the mAb against CD40L (25, 44), and since CD40L-expressing Chinese hamster ovary cells can substitute for activated T cells (25, 31), the latter pathway is considered to be mediated via CD40-CD40L interactions. Thus, IL-12 is produced by Mφ/DC through T cell-independent (bacterial stimulation) and T cell-dependent (CD40L-stimulation) pathways. IL-12 production through a T cell-independent pathway is not associated with IL-4 production. The T cell-dependent pathway is induced by conventional CD4+ T cells and various Th clones (25, 31, 42, 43, 44). Both IFN-γ-producing Th1 cells and IL-4-producing Th2 cells can express CD40L (44). However, CD40L expression by Th2 cells does not lead to IL-12 production because IL-12 expression by APC is almost completely inhibited by Th2-derived IL-10 (44). Thus, the interaction of conventional T cells (not NKT cells) and APC fails to induce simultaneous production of IL-4 and IL-12. 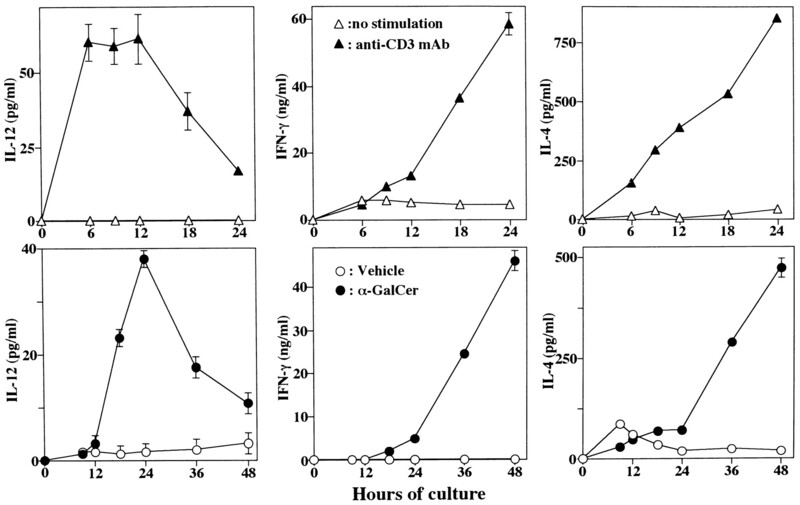 In contrast, α-GalCer stimulation culture induced both IL-12 and IL-4 production. Thus, the interaction between NKT cells and APC is quite unique in terms of the profile of cytokines produced by such interaction. CD40L has been recognized as a unique activation Ag because it is transiently induced after TCR stimulation (45, 46) and preferentially expressed on CD4+ T cells (25, 45, 47). Our present results also showed that, among NKT cells, only CD4+ NKT cells expressed CD40L after TCR triggering. It may be interesting to consider why conventional T cells and NKT cells bearing CD4 molecules can express CD40L. The expression of CD40L appears to be under complicated cellular/molecular controls. Recent studies have revealed that CD40L expression is considerably impaired in the presence of B cells (25, 48, 49, 50) by at least two different mechanisms, i.e., a decrease in the CD40L mRNA levels in T cells and the release of soluble CD40 molecules. Based on these results, cultures in this study were conducted using B cell-depleted splenocytes. Because the percentage of CD40L-expressing NKT cells was strikingly higher in B cell-depleted splenocytes from CD40−/− mice than that in B cell-depleted splenocytes from wild-type mice, CD40 molecules from cells other than B cells, such as APC, could also influence CD40L expression on activated NKT cells. Another important aspect of the present study concerns the cross-regulation of IL-12 and IL-4 production induced during the interaction of NKT cells and APC. IL-4 together with IL-10 and TGF-β are usually regarded as deactivating factors for monocytes/Mφ (51). Among the inhibitory cytokines, IL-4 exhibits rather complicated effects on IL-12 production by Mφ. The inhibitory effect of IL-4 on IL-12 production induced by microbial simulation was shown by the studies of D’Andrea et al. (52) and us (53). However, the results in both studies suggest that IL-4 may not be simply a Mφ-deactivating factor. For example, D’Andrea et al. (52) found that priming monocytes with IL-4 for 24 h resulted in a significant enhancement of IL-12 production, instead of inhibition. We also observed that addition of IL-4 to mouse splenocyte cultures stimulated with LPS/SAC + IFN-γ induced appreciable inhibition of IL-12 production, whereas stimulation of APC with CD40L resulted in enhanced IL-12 production when IL-4 was added (53). Thus, the modulatory effects of IL-4 on IL-12 production appear to be determined by the timing of IL-4 incorporation as well as the stimulatory pathway used to induce IL-12 production. It is also possible that IL-4 stimulates CD40L expression. Our present results show that, during the interaction of NKT cells and APC, IL-4 derived from CD4+ NKT cells enhances the CD40L-induced IL-12 production by APC, which is similar to the effect of IL-4 observed during the interaction of conventional CD4+ T cells and APC. Contrary to the enhancing effect of IL-4 on IL-12 production, IL-12 inhibited IL-4 production; namely, IL-4 production was enhanced especially at later time points (48 h after culture) in cultures in which IL-12 was neutralized. Because IL-12 production precedes IL-4 production, it is highly possible that this negative regulation takes place efficiently. In contrast, IFN-γ production is largely dependent on IL-12. Thus, our results show the stimulatory/inhibitory relationship among the production of key cytokines IL-12, IL-4, and IFN-γ in cultures stimulated with α-GalCer. Finally, it should be noted that, following α-GalCer administration to animals, stimulation of CD4+ NKT cells led to CD40L-induced IL-12 production. It is reasonable that such treatment would lead to the in vivo induction of activated NKT cells that can exhibit high levels of NK-like cytotoxicity to tumor cells (17, 18). In addition, the activation of CD4+ NKT cells could be used to modulate Th1/Th2 development as well as ongoing immune responses. This is based on the fact that α-GalCer treatment is capable of inducing IL-12 production through interaction of CD4+ NKT cells and α-GalCer-presenting APC. Thus, our results could provide important implications for the cytokine-based control of various diseases, including cancers and infections/allergic diseases. We thank Mari Yoneyama and Tomoko Katsuta for secretarial assistance. ↵1 This work was supported by special project Research-Center Bioscience from the Ministry of Education, Science, and Culture, Japan. 3 Abbreviations used in this paper: NKT, NK1.1+ T cells; α-GalCer, α-galactosylceramide; CD40L, CD40 ligand; β2M, β2-microglobulin; SN, supernatant; Mφ, macrophage. Gately, M. K., and R. Chizzonite. 1993. Measurement of human and mouse interleukin 12. In Current Protocols in Immunology, Vol. 1, Unit 6. Grene Publishing Associates, and John Wiley & Sons, Inc., New York, p.16. Armitage, R. J., W. C. Fanslow, L. Strockbine, T. A. Sato, K. N. Clifford, B. M. Macduff, D. M. Anderson, S. D. Gimpel, T. Davis-Smith, C. R. Maliszewski, et. al. 1992. Molecular and biological characterization of a murine ligand for CD40. Nature 357:80.